Western Digital develops every hard drive or system to serve a purpose. Since 1970 Western Digital has an industry leader in hard drive and network attached storage technology. Today they have grown to be the global leader in storage technologies specializing in external cloud storage, internal hard drives, and NAS systems. Other Features: Intuitive management dashboard, backup and sync (multiple options available), WDSmartWare Pro, Twonky media server, My Cloud OS with remote access options, high capacity storage, one touch copying, data protection, USB auto copy with import button, and streaming. Requires DLNA/UPnP or Plex devices for streaming as well as an internet connected router. 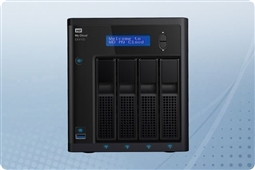 All Aventis Systems Western Digital My Cloud Expert EX4100 NAS systems come with a comprehensive 1 Year Essentials warranty with optional Secure Drive, Extended, and Express warranty upgrades available. So shop below for for the most advanced and versatile desktop NAS features available today Western Digital My Cloud Expert EX4100 from Aventis Systems!